Earlier this month, archaeologists found a sunken ship off the coast of Finland that could be the wreck of the Hanneke Wrome, a fabled vessel that treasure hunters have been seeking for centuries. The Hanneke Wrome sank in 1468 during a voyage from Germany to Estonia. Contemporary shipping records show that it was carrying more than 10,000 gold coins and lots of gold jewelry when it set sail. Today, the treasure could be worth more than $150 million. No wonder treasure hunters around the world are so excited about this find. That kind of sunken treasure doesn’t come along every day. The story made me want to jump in a boat and head out to sea while peering over the side to see whether I could spot any wrecks. The story also made me wonder just how much it would cost to equip myself to become a professional hunter of sunken gold. If you thought going to college was expensive, hold your hat. If you want to become a professional treasure hunter, you better bring some serious money with you. If you’re going to look for sunken treasure, you’re going to need one of these. And because you’ll want to save some money, you’re probably going to want to buy used. We found a pretty good boat for you at Oceanmarine.com, a boat broker. It’s 120’ long, has a full galley and sleeps a crew of 22 people – though we bet you are going to have to invest in some new linens too. Its certifications have expired, so you have to budget for that. But you can own this boat for about $375,000 and sail off to sea. What’s the point of finding stuff underwater if you can’t haul it up onto your boat? Our research shows that you can buy a decent used winch for about $25,000 to haul up your chests of 18kt gold Spanish doubloons. Figure on throwing in another $400 for rustproofing paint. The cost of marine fuel is relatively low today, less than $3.00 per gallon. But your $375,000 boat is going to need a lot of it. After all, sunken treasure isn’t going to come find you, you have to go looking for it. If you’re serious about looking for sunken treasure, you are going to need a serious seabed scanning system, not the kind of sonar devices that fisherman use to find cod. The Klein HydroChart 3500 Swath Bathymetry Sonar System looks great to us. 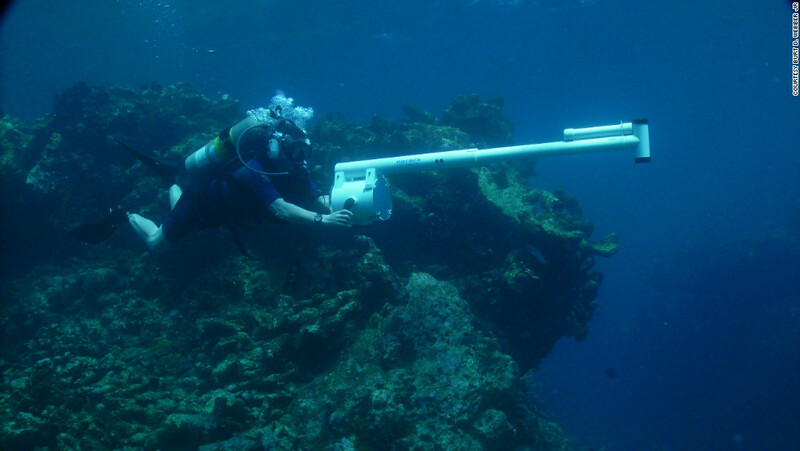 It can generate digital, photo-quality images of the ocean floor. Klein doesn’t list a price for this state-of-the-art system on its company website. (It might be one of those cases of, “If you have to ask what it costs, you can’t afford it.”) But we are taking a guess that high-end systems like this one can’t come cheap. We’re going modest here. If you hire a crew of 10 people and pay them each only $50,000 a year, you’re still going to be out half a million dollars every year. If you pepper in some scientists, deep-sea divers, sonar experts and other specialists, your payroll costs will rise even higher. You can cut corners here, because some of the many treasure ships you are going to find are going to be in such deep water that scuba divers won’t be able to get to them. But to help you explore wrecks in shallow water, DiversDirect.com, an online seller of scuba equipment, can set up four of your divers with tanks and other basic diving equipment for only about $1,000 apiece. If you are going to be spending a lot of time bringing up your treasure, you will need to hire a crew of professional divers with more full-featured equipment that will let them spend a lot of time down there poking around. You can’t just put your employees on a boat and not feed them. (Do you think they are going to catch their own fish for dinner?) If you have 10 employees, you are going to have to spend at least $20 a day on food for each of them. Laying claim to all the gold you find will be complicated. If you find the Hanneke Wrome, for example, you are probably going to have to engage in some legal maneuvering with the German government to claim that you own the treasure it holds. That will be complicated, and you will have to hire specialist lawyers to do the wrangling for you. How much will that cost? Plenty. Like we said at the start of this article, being a professional treasure hunter is going to cost you a lot of money. There is an easier way. As we have noted before on this blog, a simple metal detector – which you can buy for $500 or less – will get you started looking for treasure on solid ground. You can skip the “Ahoy, Maties” stuff and you won’t need a boat, a winch, a crew, or any of the other “extras” that underwater treasure-hunting demands. If you do decide to wear a scuba tank and flippers, that will be more of a stylistic choice than a practical one. And when you find treasure, give us a call at 800-426-2344 to discuss what you have found and how we can help you turn your gold into cash.